There are some parts of your automatic garage door that you can probably fix on your own. However, when it comes to the springs, the risks aren't worth it. Let our professional technicians handle any problem you experience with these dangerous components. The last thing you want is to be injured by a rogue spring that goes flying across your garage. Nowadays, there are two different kinds of these components. The first and older type consists of a pair of units, each one installed on a different side of the door. These extension springs, as they are called, work by stretching while the panels lower, which loads them up with tension which they later release by contracting when the door needs to open. The second type is the torsion springs. These units are set up above the door, horizontally. They work by twisting and unwinding as opposed to stretching and contracting, and therefore they essentially utilize torque in order to convey energy to the drums and the lift cables, which then pull the panels up. 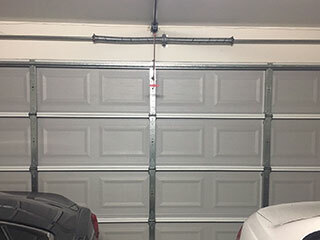 Torsion springs are often strong and flexible enough that only a single unit will need to be installed for garage doors of average weight. Due to the complex nature of these components, and to the crucial role they play, they need to be checked regularly in order to make sure they aren't nearing their breaking point. Replacing them before they break is always recommended, as the scenario of a spring breaking can be very dangerous to anyone who happens to be standing by when that happens. It's also quite damaging to the door panels. In order to maintain these components, our team will lubricate them, inspect their coils for deformations, and perform balance tests on the door. If the door fails these tests, we will perform the required spring adjustment to make sure it is returns to its balanced state. When emergency spring replacement is required, there's no one better to reach out to than our experts at Garage Door Repair Moorpark. We provide emergency services, as well as scheduled maintenance appointments. Whatever it takes to make sure your door is safe for you to use. Call us or use our online scheduling system to book an appointment today.